The DestroyIt 2604 Level P-4 Cross Cut Shredder from MBM is a great heavy duty, high volume, centralized office shredder designed to shred large amounts of material daily. The DestroyIt 2604 Cross Cut Shredder features a "SPS" (Safety Protection System) package with a electronically controlled, transparent safety shield in the feed opening. It also includes an "Easy Switch" control element that uses color codes and back-lit symbols to indicate operational status. This Level 3 Destroyit 2604 will automatically stop when your shred bag is full or when the cabinet door is opened. It also has an automatic reverse and stop in case of paper jam. The Destroyit 2604 Cross Cut Shredder has double protection against overheating, automatic start and stop controlled by a photo cell, high quality hardened steel cutting shafts that accept staples, paper clips and credit cards. All Destroyit shredders have a lifetime warranty on Strip Cut and Cross Cut shafts and wheels. All other parts have a 1 year warranty (excluding wearables). Particle Size : 3/16" x 1-1/2"
97 day limited warranty on labor or exchange at MBM's discretion""
We have been using (2) 2604s and 3 other Destroyit models for 3yrs. No problems at all, these things keep on working. Most weeks see 50 gallons of refuse per machine and it uses about a quart of oil per year. Make confetti for your football games or New Years Eve party! This is an excellent shredder! We've been using it for a couple of months now and everybody in the office loves it. And the folks at Whitaker Brothers are friendly, knowledgeable and happy to help. We are really enjoying our new shredder! It shreds smoothly even when you put 22 pages through at the same time. Our old shredder was a DestroyIt as well and lasted many, many years no one actually knows how long it had been around it had just always been there best guess way over 20 years old. When it stopped working there was no question as to what brand of shredder to get, the 2604 P-4 CC is awesome! We enjoy the auto start /stop feature and there are no words to describe how thrilled we are with the automatic oil feed! The only thing that could be annoying is the paper can build up in the bin and roll back behind it if you don't shake the bin to level out the paper, hence the 4 star rating. Having the bin is wonderful it makes disposal quick and easy. We are very happy with this purchase and recommend it highly! MBM Corporation presents the DestroyIt 2604 Centralized Office Model Business Shredder with automatic function and a 10 ¼ inch feed opening. Our innovative easy switch control element ensures simple and intuitive operation. The quiet, powerful 1 hp single-phase motor with twin-drive system provides a shred capacity of up to 30 sheets in the strip-cut version and up to 22 sheets in the cross-cut. Any strip or cross-cut version, with the exception of the super micro-cut model, is suitable for the destruction of CDs and DVDs. The ECC Electronic Capacity Control indicator ensures continuous and efficient shredding. Our precision cutting shafts are constructed entirely of high-grade hardened steel and are backed by a lifetime warranty. Safety features include an electronically controlled transparent safety shield in the feed opening. It is part of the SPS safety package which sets the standard when it comes to operational safety. Consistently high performance is ensured by the automatic oil injection on the cutting shafts while the machine is shredding. With up to 26 gallons of shred volume, our high quality shred bin allows for neat and easy shred emptying. The 2604 also comes with an environment friendly energy saving mode. DestroyIt - Quality Made in Germany. If you're looking for a heavy duty, central office paper shredder, then take a look at MBM's Destroyit 2604 Cross Cut Paper Shredder. With hardened steel blades backed by a lifetime warranty and a powerful single phase motor rated for continuous operation, this machine is prepared to devour stacks of documents every day. In addition, the many automatic and safety features make use easy and simple. A high quality wooden cabinet reduces motor noise and is mounted on casters for easy mobility. Here is a closer look that the 2604. A photo cell controlled start and stop function senses paper in the feed and starts shredding instantly. The transparent safety guard that covers the opening prevents ties and other objects from getting caught in the blades. A single control element offers stand-by, stop, and reverse functions. The stop function activates when the shred bin is full, the cabinet door is open, or if there is a paper jam. The machine helps unclog jammed blades by automatically reversing the cutting shafts and feeding the paper back out to the user. After one hour of inactivity, the device powers down to an environmentally friendly sleep mode, conserving energy while not in use. A powerful single phase motor allows continuous use without the downtime needed by smaller devices. It is double protected from overheating, saving you money on potential costly repairs. The sturdy twin drive system has a fully enclosed, dustproof gearbox housing to prevent corrosion. 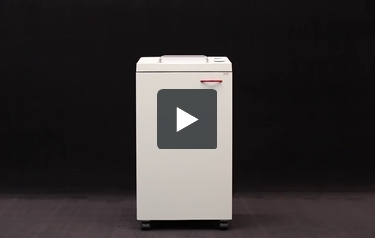 An automatic oil injection system ensures your shredder stays in top working order. The cross cutting mechanism can take up to 22 sheets at once through the 10.25 inch opening and eats them as fast as 18 feet per minute. An Electronic Capacity Control indicates varying sheet capacity levels while shredding to help prevent paper jams. The blades also accept staples, paperclips, credit cards and CDs and convert them into small particles only 3/16 inch by 1-1/2 inches in size. This is minute enough to earn a level 3 security rating, resulting in protection for your information. Finally, the shreds are collected in a 26 gallon shred bin housed in a high quality wooden cabinet. The wood acts as a noise reducer by absorbing some of the sound put out by the motor. The particles only offer a level 3 security. While this keeps most office information safe, businesses needing to dispose of highly classified documents may be interested in this model in a higher security version. Eighteen feet per minute is a decent rate of shredding but may feel slow if you have higher volume needs. MBM offers many other shredder models with faster rates. A 10¼ opening limits what can easily slide into the shredder. For most offices, this is wide enough and won't be a problem. If your business has a large quantity of wider documents to shred, you may consider a different model with a wider feed. For a centralized office shredder, this is a great choice. The features on this machine give you reliable, easy, and convenient use. A lifetime warranty on the blades with a one year warranty on the rest of the machine offers peace of mind. We would definitely recommend the 2604 for your next central office shredder. Shred Speed 18 ft./min. 24 ft./min. 18 ft./min. 30 ft./min. 20 ft./min. 25 ft./min. 30 ft./min. Feed Opening 10 1/4" 10 1/4" 12" 12" 16" 16" 16"
Dimensions (D x W x H) 18 1/2" x 19 1/2 "x 36 1/2" 14 3/4" x 19 3/4" x 34 1/4" 18 1/2" x 21" x 36 1/2" 23" x 22" x 40" 23 1/4" x 25 1/4" x 38 1/4" 23 1/4" x 25 1/4" x 38 1/4" 23 1/4" x 25 1/4" x 39 3/4"